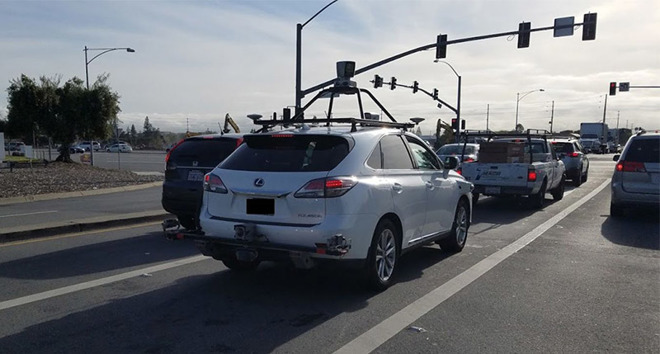 Apple's self-driving technology testbed, an optimized Lexus RX450h SUV bristling with an array of advanced sensors, was spotted driving on Silicon Valley roads on Thursday, offering the first real-world look at the company's highly secretive autonomous vehicle project. 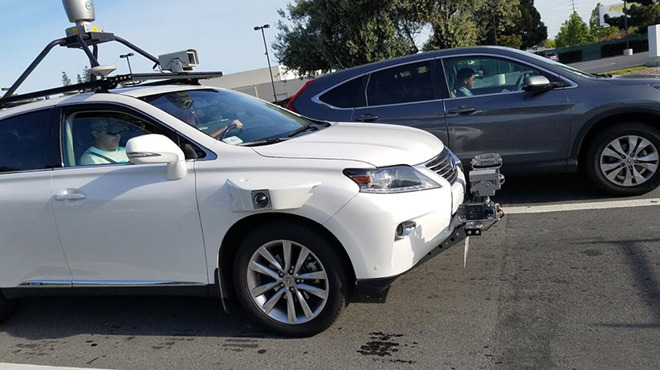 Photos and a short video showing Apple's RX450h were sent in to Bloomberg after a tipster saw the vehicle leaving an Apple facility. The images fail to offer much in the way of new information, but provide insight into the technology Apple is using to test its self-driving hardware and software suite. For example, a Velodyne LiDAR 64-channel unit is mounted on the SUV's roof, while radar arrays are positioned on the front and rear bumpers. Multiple cameras, mounted in protective housings along the car's exterior, likely offer a near 360-degree view of the vehicle's surroundings. As can be expected, Apple's testbed compares nicely to other self-driving car platforms currently in testing by Google and Uber. Those vehicle systems also include some form of LiDAR, positional sensors and cameras aplenty. Reports last week revealed Apple's Autonomous Vehicle Tester (AVT) Program Application, which was filed and subsequently granted by the California Department of Motor Vehicles. Of note, the document contained a copy of the evaluation process Apple used to certify six drivers who will pilot the three modified 2015 Lexus RX450h SUVs. AppleInsider later received a full copy of the application, which notes all six test pilots passed the evaluation process and were thus ready to take the RX450h on the road. Interestingly, photos of the evaluation model revealed Apple was at one point using a Logitech steering wheel and pedals to perform drive-by-wire controls. That hardware is not present in the test vehicle seen today, meaning the configuration was only for evaluation purposes or the company has integrated the technology with Lexus' onboard systems. Apple has long been rumored to be working on autonomous vehicle technology under its "Project Titan" initiative. A branded car was part of the initiative's original plans, but the company abandoned the aggressive goal in late 2016 after the project hit a number of snags. Formerly led by Steve Zadesky, Project Titan was later handed over to SVP of Hardware Engineering Dan Riccio and then to longtime executive Bob Mansfield. Under Mansfield, the team was whittled down and efforts refocused to self-driving software and supporting hardware.